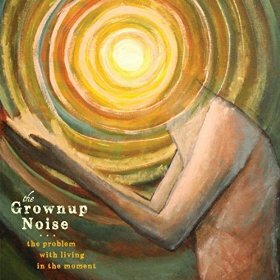 Album Review: The Grownup Noise, "The Problem With Living in the Moment"
Clean, neat and warm sounds fill this latest release from Boston’s The Grownup Noise. A full mix of acoustic guitars, piano, violin are part of the mix that color The Problem With Living In This Moment, their third album. Some tracks “rock” a little louder and harder than others but as a whole, this album flows together well – a well balanced cross between the nouveaux-Americana sound and pop-revival. In listening to this, the band’s name fits appropriately – it’s mature, skilled and yet has that sense of youthful energy. The first three tracks run in harmony: “My Ride’s Almost Here” sounds like a table setter with its sedate yet lush arrangements leading into the hook-y pop of “New Outsiders” and leveled by “Everything Out”. “Astronomy As Therapy” is as melodic and roots-y as one could hope for – listen to the brushed drums, cello and banjo – a glorious mixture; “The Fight Against Paranoia” has a chorale-style opening before kicking into an oddly-timed rhythmic pop gallop and “Come Sunday” shuffles at a joyfully breakneck pace with accordion and finesse (possibly my favorite track on this album). “Outside” is sheer guitar pop and “Swim” closes the collection on a quiet note with just acoustic-picked guitar and one vocal. Quite an impressive gathering of songs, songwriting and performance. Hopefully, people will take notice from the sounds made by The Grownup Noise on this third album. After all – third time’s the charm.